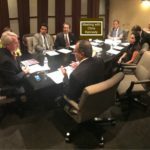 The Executive Committee of AMVOTE-PAC met with three Illinois gubernatorial candidate: Chris Kennedy on September 27, 2017, J.B. Pritzker on December 18, 2017 and finally, with Daniel Biss on January 10, 2018 as part of its vetting process. Profile: Mr. Kennedy met with the Board on September 27, 2017. He is the son of former U.S. Senator Robert F. Kennedy. In the past, he has served as Chairman of the Board of Trustees for the University of Illinois (2009 to 2015); President of the Merchandise Mart Properties; Chairman of the Greater Chicago Food Depository; Chairman of the Chicago Convention and Tourism Bureau. He has served as board member of Archer Daniels Midland, Areil Investments, Catholic Theological Union. He currently is Chairman of Joseph P. Kennedy Enterprises. Mr. Kennedy grew up in McLean, Virginia. Her received a B.A. degree in political science from Boston College, and his MBA and law degree from Northwestern University. He is married with four children. Health Care in Illinois: As a former small business owner, Mr. Kennedy was concerned about the impact of Health Care Insurance premiums on small businesses who sometimes must self-insure due to high premiums. He advocates a single payer system. He favors the protection of nursing home patients. He feels that Medicare, Medicaid, and HMOs require scrutiny so that citizens are not denied needed health care. Cook County Democratic Party: Mr. Kennedy questions the Cook County Democratic Party for favoring property tax for certain companies, thereby reducing much need tax revenues for better education. International Trade to the Middle East: Mr. Kennedy would be happy to join trade missions to the Middle East to advance Illinois’ commercial wellbeing. “Sanctuary” State: Kennedy favors a sanctuary status for Illinois and added that sanctuary status enhances effectiveness of law enforcement. Arab and Muslim Advisory Board to the Governor: Mr. Kennedy advocates the establishment of a State Advisory Board on Arab/Muslim affairs. He stated that discrimination has no place in government and he will rid anyone from government who practices discriminatory behavior. Profile: Pritzker is a graduate of Duke and Northwestern law school. He is known as a philanthropist and private business owner based in Chicago. He manages the Pritzker Group, the largest venture investor group in the Middle West. He has donated tens of millions to fund educational and humanitarian causes. He founded the Pritzker Consortium on Early Childhood Development at the University of Chicago with Nobel Prize-winning economist James Heckman, which researches and funds early childhood care of impoverished children. He is past chairman of the Illinois Holocaust Museum, and he is the principal funder of Cambodian Genocide Tribunal Monitor. “I’m Jewish, but I care”. Health Care in Illinois: Mr. Pritzker advocates a single payer system, and would immediately implement an expansion of Illinois Medicaid to those who wish to “buy in” at an estimated cost of $3600/person a year. This is “first step” to a single payer plan. Workers Compensation: Pritzker stated that the long-standing stalemate on revamping worker’s compensation system in Illinois requires “compromise” with the legislature, workers and employers. Criminal Justice Reform Plan: On crime, Mr. Pritzker discussed his “Criminal Justice Reform Plan” which would be administered by his running mate for Lt. Governor, Juliana Stratton. His plan would focus on ending gun violence, revamping recidivism, automatic expungement of defunct juvenile records, and normalizing onerous marijuana laws. 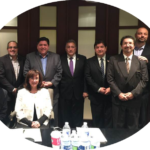 International Trade to the Middle East: Pritzker favors international trade with the Arab Nations and consider opening the first Illinois “trade office” in the Middle East, and accompany local organizations on trade missions to the Middle East. 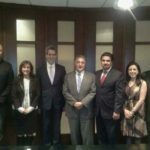 Arab and Muslim Advisory Board: Mr. Pritzker would revive the defunct Arab and Muslim Advisory Board to the Governor, and he pledged to appoint qualified Arab and Muslim American professionals to “top echelon” positions of his administration, in consultation with local professional and community groups. He noted that his press secretary, Jordan Abudayyeh, is a Jordanian American. Profile: Biss is a former math professor at the University of Chicago. He is legislator from Evanston where he resides with his wife and two children. He grew up in Bloomington, Indiana and received a BA degree from Harvard and a Ph.D. from MIT. He states that when he was an educator he confronted “state’s most critical problems” which led him to become an “organizer” and finally a legislator since 2011. Mr. Biss denied that his separation from his former running mate, Chicago Alderman Carlos Ramirez-Rosa, was about Ramirez-Rosa’s support of Divestment. Rather, it was due to a clear inconsistency between the campaigns. Biss claims that his running mate reneged on an apparent understanding or agreement on certain issues. He volunteered that he has visited the West Bank and sat down with Palestinians there, and he opposes “the wall”. Progressive Politics: Biss stated that he is a “progressive” in that he shows great concern for human and civil rights for all communities. Minorities, Diversity and Islamophobia: Biss feels that there should be more representation of all minorities, including Arab and Muslim Americans, and he would find qualified persons from our community to take high end positions with the State to be “role models”. Islamophobia: Biss abhors Islamophobia which he believes has encouraged hate crimes throughout society. He discussed some Asian American initiatives as a legislator, but did not present any information about his work on behalf of other minority communities. Trade Mission: He favors a trade mission in the Middle East. Education and Taxes: He advocates revamping Illinois’ system, and advocates more school funding, he does not favor private school vouchers due to lack of resources for public schools. Health Care: He advocates a single payer health care insurance system, perhaps beginning with Medicaid buy ins or an effective state insurance exchange. He feels that the health care system is unfair to small and medium size businesses: “Health care is a human right”. Other Issues in General Assembly: He voted for a bill barring Illinois from investing funds in companies with a record of Divestment. However, he would protect the right to engage in Divestment as a peaceful means of protest that is protected by the Constitution. He seemed unfamiliar with the new Hate Crime Sanctions Law. Status of Campaign: He declared that his campaign has raised $3 million dollars. He feels that if nominated, he would raise funding to compete with the republican candidate through national Democratic leaning supporters who seek a Democratic governor in Illinois. Biss’ Record with Arab and Muslim Community: Dan has been a close ally of the Muslim and Arab communities in north Cook County, and he has had good interpersonal relationships with some members of the Executive Committee who advise that he is a brilliant man, and a gifted, sincere speaker.